How often do you hear kids calling out "CLEAN ME UP!" but that is exactly what 4,000 kids did at Dockweiler Beach on a 100 degree day at the beach for Kids Ocean Day in Los Angeles. 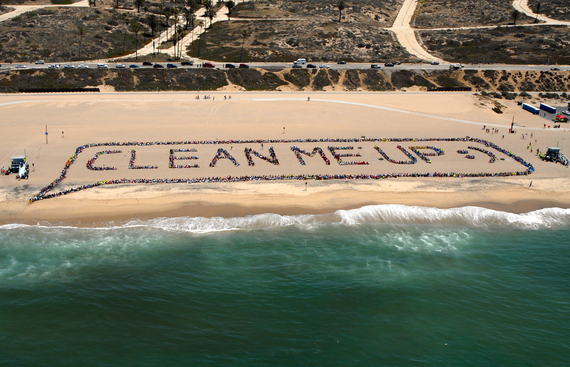 Despite the record temperatures, Michael Klubock, founder of The Malibu Foundation, and Aerial Artist John Quigley and a team of volunteers worked successfully with 4,000 school children from 33 Los Angeles schools to send out a message in the sand to all grown-ups, especially legislators and other decision makers, that our oceans are in trouble and need help. The Malibu Foundation provides in school and on-the-beach education to school children about our precious oceanic resources and our responsibility to keep the oceans free from pollution: especially chemicals and plastic pollution that reach our oceans through storm water and rivers that all lead to the ocean with a toxic mix of man-made waste. The 4,000 children cleaned the beach of trash: most of it is plastic and not biodegradable, trash that stays around forever and causes significant harm and death to sea creatures when it enters their ecosystem. Also, the plastic trash and chemicals that enter the ocean become part of the food chain, poisoning the sea life that we consume. Research has shown that small broken bits of plastic and plastic microbeads are consumed by fish we eat. Luckily, there are legislators in California who hear the message from the children and have authored bills currently up for action in the California Legislature to help Clean Up the Ocean from plastic pollution, the number one type of trash polluting our seas. Senators Padilla, DeLeon, and Lara have a State Wide Plastic Bag Ban (SB 270) that has garnered support from a wide range of groups seeking to keep the plastic bag, the number one plastic pollutant out of our environment. California already has 76 local Bag Ban Ordinances in effect, covering 105 jurisdictions in California. Hawaii has banned plastic bags on each of its islands. Please add your voice to the call for California's state wide legislation to ban plastic bags Here. Also, Assembly Member Richard Bloom has authored AB 1699, a Plastic Microbeads Ban sponsored by 5 Gyres Institute that seeks to rid personal grooming products of plastic microbead exfoliants that wash straight down the drain and into the ocean, bypassing filtration at water treatment plants because of their small size. These microbeads resemble fish eggs and are consumed by fish that we humans consume. The plastic microbeads are found in facial and body scrubs and even toothpastes. Natural alternatives like rice bran or apricot husks are not only biodegradable and nontoxic, but also work better because the perfectly spherical surfaces of plastic beads are not good exfoliants, simply sliding over the skin's surface before washing down the drain. The bill has been approved by the California Assembly and now moves to the California Senate for a vote. Please encourage the California Senate to pass the Ban on Plastic Microbeads Here. Kids Ocean Day, sponsored by The California Coastal Commission, was celebrated at 5 other beaches along the California Coast with over 8,500 children participating in the program statewide. "The students and teachers who participate in this program are leading the way to a more sustainable world, says Steve Kinsey, Chair of the California Coastal Commission. "They are coastal stewards, caring for the beach and raising awareness. 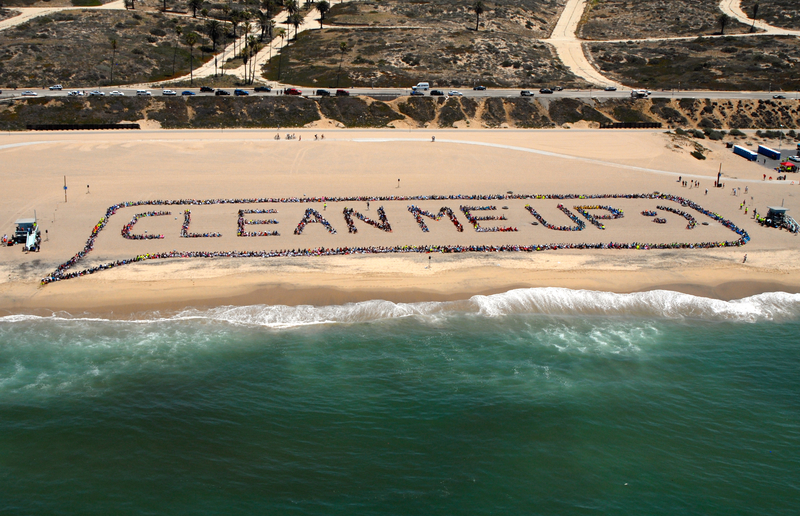 I hope the people who see their aerial art design in the sand will be inspired by their example and heed their message: that our lives depend upon each of us doing our part to help take care of the ocean." Steve Kinsey told the crowd assembled that we are tantalizingly close to having a state wide plastic bag ban and asked the kids "How many of you and your families bring your own bags to the market?" A sea of hands went up.